Since I was a kid it's always been a tradition of my family's to put up our Christmas tree the day after Thanksgiving (Black Friday). Now that I'm with Rudy we've taken over this tradition since our first Christmas together and we plan to continue for many years to come. The only part of the house we usually decorate is the living room, apart from outside of the house which my dad usually does himself. The living room usually looks the same every year and you can see some photos I shared last year right here. This year I decided I really wanted to include my room in the festivities. In October Rudy and I purchased a small tree for my room and I've been so eager to put it up. I'm not going to lie I wanted to put up all my Christmas decorations the day after Halloween but I love that I waited because it makes it all so much more special. This afternoon Rudy and I finally put up our Christmas decorations. 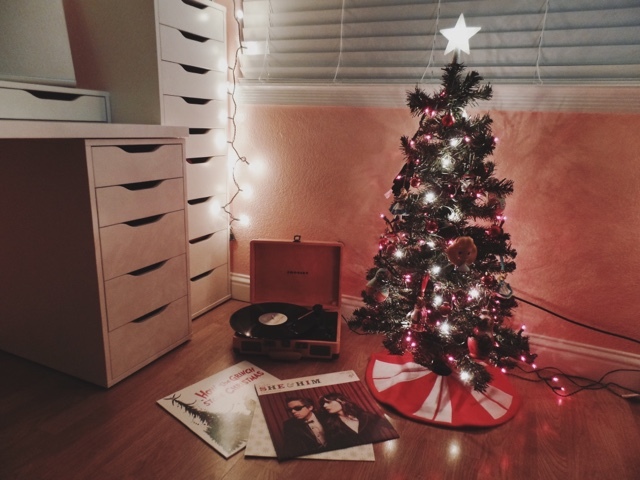 We set up our tree and decorated the room while listening to some of my Christmas vinyls. It was the most satisfying feeling looking at everything once we were all done. I'm so happy with how everything turned out. We are now relaxing, sipping on some tea, cozy in bed and watching one of my all time Christmas movie, The Grinch. I hope you enjoy all the photos! Your room looks so warm I love it. I love how your room turned out, so cute! The star was a good choice. I really wish I got one that lit. Thank you I'm so happy wth how it looks. I really like the star and I'm glad I grabbed it since now all I see is the one with colored lights. Ahhh that's good! I kind of want to go and buy one that lights up but I'll probably wait I think I have enough lights. I'm going to be so sad when I have to take everything down. I kind of want to keep the lights around my window though lol. I really like them . Wonderful! You are decorating your house and the tree for Christmas looks so cool and beautiful at the same time. I really got inspired.